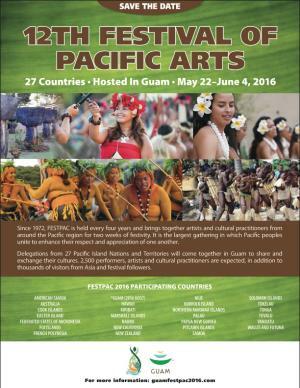 Guam made its bid to host the 12th Festival of Pacific Arts and was awarded this distinction at the 10thFestival held in American Samoa, in 2008. It was during the 11th Festival of Pacific Arts held in the Solomon Islands, July 2012, where Guam officially received the festival flag. The 2016 festival is Guam’s opportunity to showcase its unique Chamorro culture that has survived colonization of the past and modernization of the present.